Jessica “JaeJae” Julian (2010) and Marko Zivanovic (2014) are proving that giving back shortly after graduation can be possible. 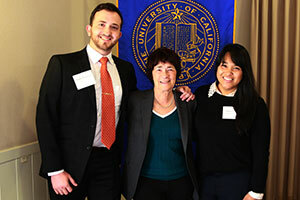 During the campus’s Giving Tuesday fundraising efforts last December, Julian and Zivanovic became the first alumni to create scholarship endowments at UC Merced by pledging $10,000 each over the next five years. Once their pledges are fulfilled, a 3-to-1 match offered by Foster Poultry Farms and Wells Fargo will turn their gifts into $40,000 endowments. Through the UC Merced Alumni Endowed Scholarship Match Program, Foster Poultry Farms and Wells Fargo will match up to 10 alumni gifts of $10,000 each — made payable as an outright gift or over a multiyear pledge. “I knew there was an opportunity to make a fantastic impact,” said Zivanovic, who graduated with a bachelor’s degree in applied mathematics. Zivanovic learned about the scholarship match through the Alumni Association Board, which he joined last October. He knew instantly that he wanted to help future Bobcats. His goal in establishing an endowed scholarship is to help retain high-achieving students who might consider leaving the campus without added support. Once his pledge is fulfilled, the endowed scholarship will be available to students in the School of Natural Sciences who have at least a 3.7 grade-point average. For Julian, who was the first in her family to graduate college, receiving scholarships during her time on campus alleviated a lot of stress for her family. Since graduating with a bachelor’s degree in psychology and cognitive science, Julian has worked in several departments on campus and now serves as an alumni relations specialist with Development and Alumni Relations. Julian wants to see future Bobcats succeed and she thinks alumni play a large role in making it happen. Julian and Zivanovic both chose to name their endowments after their families. The Ganio-Julian Family Endowed Scholarship Fund honors Julian’s father, a Filipino immigrant farm worker who settled in Delano. It is also a tribute to her mother, who is from Hawaii, and has worked relentlessly to raise Julian and her four siblings. By establishing the Zivanovic Family Endowed Scholarship Fund, Zivanovic is recognizing his parents, who came to the U.S. from Yugoslavia nearly five decades ago. Julian hopes her gift will produce a ripple effect. For information about the UC Merced Alumni Endowed Scholarship Match Program or other alumni giving opportunities, contact Alumni Relations at 209-228-ALUM or email alumni@ucmerced.edu.